The Toyota Tundra is beefy and capable truck that you can rely on but despite we hoped for some improvements in performance, fuel economy, comfort, towing and safety as well for the 2017 model it appears that this model will remain outperformed in all these areas by its rivals from Ford, Ram, and Chevrolet. However, the Tundra can deliver a lot of fun especially if you are ready for desert runs, ride over rugged terrains and dirt roads. For that purposes the 2017 Toyota Tundra TRD Pro will be excellent solution for everyone. Is there something new for 2017 Tundra? Unfortunately, the Tundra hasn’t changed much for 2017 model year either. The changes are limited to some equipment regrouping and color mixing. All Tundras now include a tow hitch receiver; power adjustable seats are from now standard on the Limited version. Inferno body paint has been removed from the offer for the TRD Pro and included in SR5 and Limited trims. New colors available on SR5 trim are Black, Super White and Barcelona Red Metallic. For riding on off-road terrains and in unfriendly conditions, the 2017 Toyota Tundra TRD Pro includes some additional hardware that you won’t find on more conventional versions. Tackling the rocky terrains and off-road conditions will be more pleasant experience thanks to Blistein shock absorbers, while all-terrain tires will provide additional grip. There is also beefier front skied plate for safer approach on rough surfaces. Under the hood is a familiar 5.7 liter V-8 which can send 381 horsepower and torque of 401 pound feet to all wheels via the standard six-speed automatic transmission. 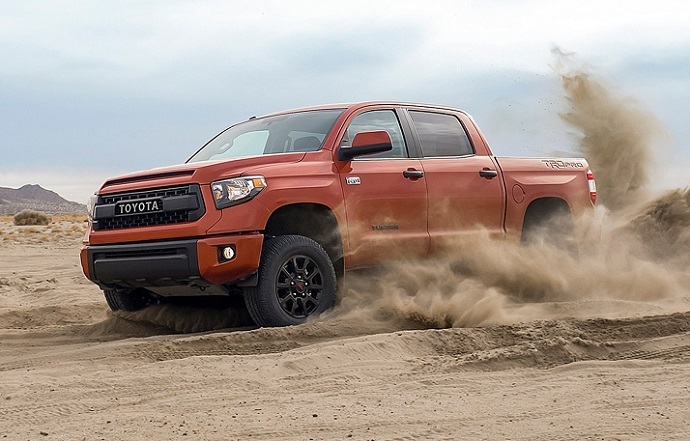 With this powertrain the TRD Pro can hit 60 mph in 6.7 seconds which is quick for this size truck yet the score which is average for the class. On the fuel economy front this Tundra version will return 15 mpg combined or 13 mpg in city and on highway 17 mpg. As for towing, it is equipped with tow kit and peak towing capacity is 9, 800 pounds. Exterior design of the 2017 Toyota Tundra TRD Pro is the form which has been there since refresh in 2014 but with some unique elements distinguishing this off-road version from the rest of the lineup. In that context, this model includes dark grille interpretation and it rides on 18-inch alloy wheels with dark rims. Raised suspension travel is also noticeable from profile perspective and model also has TRD pro logos. Aside from mentioned it is equivalent to other versions. Inside the all Tundras are well-built and attractive while TRD Pro is fanciers thanks to unique trim inserts and better equipped than base models. It uses a 7-inch screen based Entune infotainment system which is easy to understand and use. The front seats in Tundra are broad and supportive even for long rides. It also has unique stitching and leather upholstery with TRD logo. In terms of available features, the TRD Pro offers 18-inch wheels, fog lights, full power accessories, heated mirrors, keyless entry, tilt and telescopic steering wheel, auto dimming rear mirror, etc. An eight-way power adjustable driver seat and four-way passenger seat are also included. Techwise it offers 7-inch touchscreen interface, navigation, traffic information, satellite and HD radio, nine speaker sound system, etc. As for safety it owns rear cross traffic, blind zone monitoring, front and rear parking sensors, etc. The 2017 Toyota Tundra TRD Pro is available in double cab and CrewMax body styles. The price for the new model year has been up for about $540 across the range and well-equipped TRD Pro is available for around $45, 000.